For many years the teenage consumer has been a power house when it comes to setting trends and this year is no different. Here are five great trends that the teenage girls love and are hanging onto for their summer look. Take a look at what's hot! Hemp Jewelry is a hot look when the weather turns warm and this year we are seeing a bit return to it! 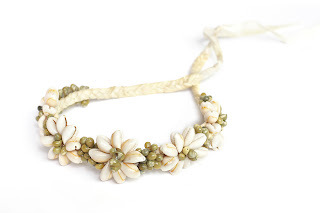 You can find just plain hemp jewelry or hemp jewelry with beads or shells attached to it. You can find hemp necklaces, bracelets and anklets for teen girls and hemp necklaces and bracelets for teen boys. The trend is even bigger in coastal communities and hemp jewelry can be found in abundance. Kids even love making their own to wear and trade with their friends. Wood, Bead and Shell Jewelry seems to never go out of style with the teenagers and this year we are seeing big, bold and colorful looks being sported around by the younger set. When looking for colors in this jewelry trend stick to the summer tropical citrus colors or go with neutral white, ivory or khaki colored shades. Necklace Layering is really popular this season with the teen girls. We are seeing them mix up chains with beaded necklaces, cord necklaces or with woven hemp necklaces. For this trends, the more materials they can mix up with their layered necklaces, the better! In addition, chokers are out and the longer lengths are in! Bracelet Layering has been in style for many months and it is not going away anytime soon. The girls love layering different styles of beads, ropes, chains and more with multiples on their arms at all times. It is a fun colorful way to wear jewelry and show some style. Rings, Rings and More Rings! Teen girls are really layering on the rings this season and we are seeing a lot of stack rings all on one finger or seeing girls wearing 3-4 rings on each hand. For this trend we recommend looking to the fashion jewelry market or the sterling silver jewelry market to keep costs affordable. Any way you look at it, the teen girls are creating their own fabulous look and many older fashion and jewelry lovers are following it too. Which one of these looks would you wear? by Karen Mollison, contributing editor at Chasing Treasure.com, online retailer of high quality jewelry boxes, watch cases and jewelry armoires. I'v pinned these images to my Pinterest boards.